Bingo Street is one of the most friendly bingo sites for UK bingo players that we have found. If you like to chat and you like to make friends than BingoStreet is never far away. Have a look for your self and you are sure to make some new friends while you are there. Bingo Street is here and it’s hot! 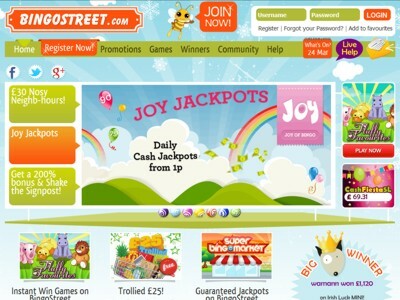 Check out the brand new online bingo site to hit the UK bingo circuit, Bingo Street. This latest gem from Joy of Bingo will have you rushing in to join as soon as you’ve seen it. Designed around a classic British street BingoStreet has shop fronts that take you to the different sections. Visit the Bank, the Arcade and the different bingo rooms on the Bingo Street. The Members’ Section is called My House and players have to sign in to their House to manage their account. Packed tight with online bingo, Instant Games, chat games and loads of promotions BingoStreet soon will be at the top of the UK bingo charts. Start off with a big fat welcome. Deposit just £5 minimum the first time and get a 200% bonus on this deposit, plus play Shake the signpost where you can win anything up to £5 extra free. Deposit any amount from £5 to £100 and shake to win. Get a cool 60% re deposit bonus on every deposit you make hereafter. The Super bingo market has the Pre-Buy games. There’s the £50 Deal of the Day, the £500 Weekly special, the monthly £5K Cash Checkout and Quality Treats every other Thursday. You can buy tickets in advance for all these bingo games. Win cash and High Street vouchers here. This UK bingo site is also crammed with Free and Cheap ticket games under the Penny Stretcher tab. Play free 75 ball games nearly all day long in the Free 4 All for bingo funds and play 90 ball games with free tickets on Freesy Street from 6pm to midnight daily for real cash prizes. There’s £10 guaranteed in every game. Play penny bingo games in The Local for 1p to 4p tickets from 10am till 1am every day. This online bingo hall has six exciting bingo games. Play classic 90 and 75 ball games and try your hand at Swedish bingo too. Win a prize on every line in this variation on the 75 ball bingo ticket. What’s a bingo site without progressive jackpots? At BingoStreet.com there are three progressive jackpots on the bingo games and there are more on the Instant Games too. Scoop big money on the Street Party 75 ball progressive, Open House 90 ball progressive and on the 5 Line Lolly which is the Swedish bingo progressive jackpot. Walk on the Road to Riches on Bingo Street and play more bingo games through the week and on the weekend to win bingo funds, cash prizes, Joy Points and other goodies. Play chat games in the 75 and 90 ball bingo rooms for more goodies. Standard brands for making deposits, like Neteller, PayPal, Switch, Solo, Mastercard and Visa are all available at BingoStreet.com. Customer support is available on email, phone and even on live chat. This site brings every ingredient that we expect from a top class online bingo site. Join today and see for yourself. If you play slots games than you will find all that you can handle at this site. You can choose from Community Slots, Popular (Regular) Slots, or Progressive Jackpot Slots. This bingo site has been tested, reviewed and approved. You are guaranteed to join a great bingo neighbourhood! First Deposit Bonus: 200% + win up to £5 FREE! Loyalty Program: BingoStreet will give you Joy Points (loyalty points) every time you purchase cards! They will automatically credit your account with points every time you make a deposit. Then simply convert your points into £££’s and use them to buy cards into the games! A huge welcome bonus awaits you with their 200% First Deposit Bonus BingoStreet.com. Since they want to make sure that you stay happy in their neighbourhood, we offer a fantastic range of bingo promotions, which are updated periodically. Play today on Bingo Street and find your way to a win!